Fennel root, also known as anise, is a great stand-in for onion (a high-FODMAP ingredient) texture-wise. Like onions, it has an earthy root flavor—but with a licorice flavor all its own. Roasting mellows that flavor and also sweetens the taste. This delicious orange-fennel salsa serves as the dressing for seared tuna served on a bed of baby spinach. Preheat oven to 425F. Spray a baking pan with baking spray or lightly coat with oil. In a small bowl combine 2 teaspoons garlic-infused oil, smoked paprika, coriander, salt, and pepper. Brush tuna steaks on both sides with spice mixture and set aside. Cut stalks off fennel bulb and discard. Cut the bulb in half through the root end. Cut out V-shaped "core" from each half at the root end and discard. Slice fennel halves into ¼ inch thick planks and place on the baking sheet in a single layer. Drizzle with 2 teaspoons of garlic infused oil. Roast until the fennel turns medium golden brown with some dark brown spots, 11 to 13 minutes. Turn the pieces over and roast until browned on the other side, 5 to 6 minutes. Remove from the oven and cool. While the fennel is roasting, thoroughly wash one orange and zest it into a medium serving bowl. Squeeze the fruit to make ¼ cup orange juice. Peel and chop the fruit of another orange. To the orange zest, add the juice, chopped orange sections, olives, parsley, oregano, cider vinegar, scallions, remaining 2 tablespoons of garlic-infused oil, salt, and pepper. Coarsely chop the cooled, roasted fennel and stir it into the orange salsa. Stir occasionally as the flavors blend. Preheat a heavy skillet over medium heat; drizzle with canola oil. Add the tuna steaks to the pan and cook until browned on the bottom, 3 to 5 minutes. Turn and cook for 3 to 4 minutes on the other side. Remove the tuna from the heat when it is still slightly pink in the center; it will continue to cook as it rests. This cooking time is for 1-inch thick tuna steaks; if cooking thinner steaks, reduce the time. After 2 to 3 minutes rest, slice the tuna into strips. 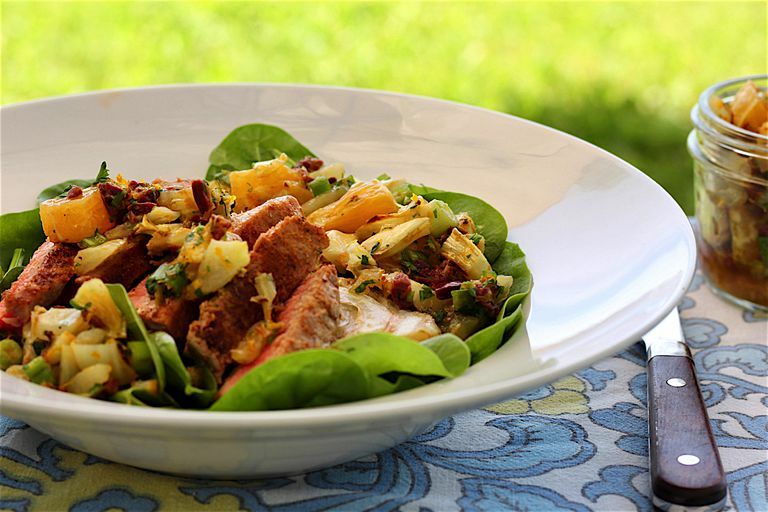 For each serving, plate 1 ½ cup baby spinach, add ½ cup Roasted Fennel Orange Salsa, then top with ¼ of the seared tuna strips. Instead of roasting the fennel, use it raw. Trim the bulb and slice it into paper-thin slices. Skip slicing the tuna into strips; cut the tuna steaks into 4 portions before searing, and place the whole piece on top of the salsa. One pound of cooked chicken or pork tenderloin can be used in place of tuna. A fine rasp grater (Microplane brand, for instance) makes quick work of zesting citrus and makes it easy to avoid the bitter white pith. Citrus zest gives a great low-FODMAP flavor kick to any dressing or salsa. Each serving is 4 ounces of tuna with 2/3 cup salsa and 1 1/2 cups spinach.